Time to revisit the fitting strategies of another lens that has performed very well for doctors and their patients since its introduction -- Biofinity Multifocal. This monthly contact lens offers one of the largest ranges of parameters on the market, and with so many choices a fitting guide can come in handy as new ODs develop their strategies for meeting the demands of contact lens wearers around age 40 or over (read more about the normal focusing change that occurs around 40 here). 1) Determine Dominance I always like using the +1.50 blur out method -- the eye that is most bothered by the plus is the dominant eye. 2) Select Distance Power Start both eyes with their vertexed, spherical equivalent distance power. Note this is different than the original fitting guide that suggested switching to the N lens as soon as you reach +2.00 add power. Many doctors still have great success switching to N at that point, but for best distance vision and driving performance, CooperVision now suggests delaying that switch to N unless absolutely necessary. 1) Over refract the dominant eye. Try to push -0.25 up to -0.50 over the dominant eye to improve distance. 2) If that does not work, then drop back to the original vertexed power, and drop the add a step lower. For example if you started with a -2.00 +2.00 D lens, and going as high as -2.50 over the dominant eye didn't solve the distance complaint, then try -2.00 +1.50 D as your next choice. 1) Over refract the non dominant eye. Try to push +0.25 up to +0.50 over the non-dominant eye to improve near. 2) If that does not work, then drop back to the original vertexed power, and increase the add a step higher. For example if you started with a -2.00 +2.00 D lens, and changing to -1.50 +2.00 D lens didn't solve the near complaint, then try -2.00 +2.50 D as your next choice. 3) If that does not work, then drop the add back down to the original starting place and try the N lens. For example if you started with a -2.00 +2.00 D lens, and changing to -2.00 +2.50 D lens didn't solve the near complaint, then try -2.00 +2.00 N as your next choice. This goes without saying if you have read any of my other posts on multifocal contact lenses, but setting the patient's expectations is key to success. Multifocal lenses require that both eyes are open for best vision, so comparing the two eyes is a recipe for disaster. The patient is going to want to do this at first, and it is your job as the doctor to reassure them that it is not supposed to look the same out of each eye, especially as soon as you start making any changes to improve distance or near suggested above. The second you switch to the N lens, distance vision is not expected to be better than 20/30+. You have officially sacrificed the non-dominant eye's distance vision as soon as you change to an N lens, and you have to prepare the patient for that sacrifice and its pros and cons. If your patient has higher than -0.75D cyl (astigmatism) they are likely not a great candidate -- especially if the astigmatism is on the dominant eye. If the patient needs a +2.25 or higher add, and has very small pupils (which is common as we age), then use 2 N lenses if they are demanding good near vision. The D lens optical zone for distance is 2.3 mm in size, so if the patient has a pupil no larger than 2.3 mm in size, they will NEVER get into the intermediate or near zones. As soon as you change to 2 N lenses, remember their distance at best is 20/30 so make sure they are prepared for this lowered distance expectation. The comfort of Biofinity is one of the biggest perks -- very thin and highly breathable. Unless your patient has difficulty with insertion and removal and swears by the original Purevision lens because everything else is too thin, they are going to love Biofinity. I don't think I have ever had anyone in 3 years of fitting this lens that said they didn't like comfort, unless they had handling issues or major dry eye issues (but that's why we have new daily multifocal products like Cooper's own Proclear Multifocal 1-Day). Another potential perk for this lens is the ability to use the distance center design for off-label uses like slowing myopic progression. There are currently studies underway to investigate this usage and its effectiveness. Recent articles in Contact Lens Spectrum have reported that using a distance center design multifocal contact lens to slow the progression of myopia may reduce the rate by 30%! No official study results out yet with the use of Biofinity Multifocal for this purpose, but hopefully we will be getting more information soon and ODs around the country may have a new option for parents concerned with their child's visual development. I've been a contact lens wearer for more than 25 years, and have been wearing Biofinity Multifocals for almost two years. I'd like to know if you have a plausible explanation for the following results. I wear OS -4.75 +1.00 add, OD -4.25 +1.00 add. If I simply change to +1.50 add power in both eyes and keep the same distance power, my DISTANCE vision improves significantly. How can this be? I can only surmise that the designs of these lenses are not consistent across different powers. You are correct that this isn't the expected response. 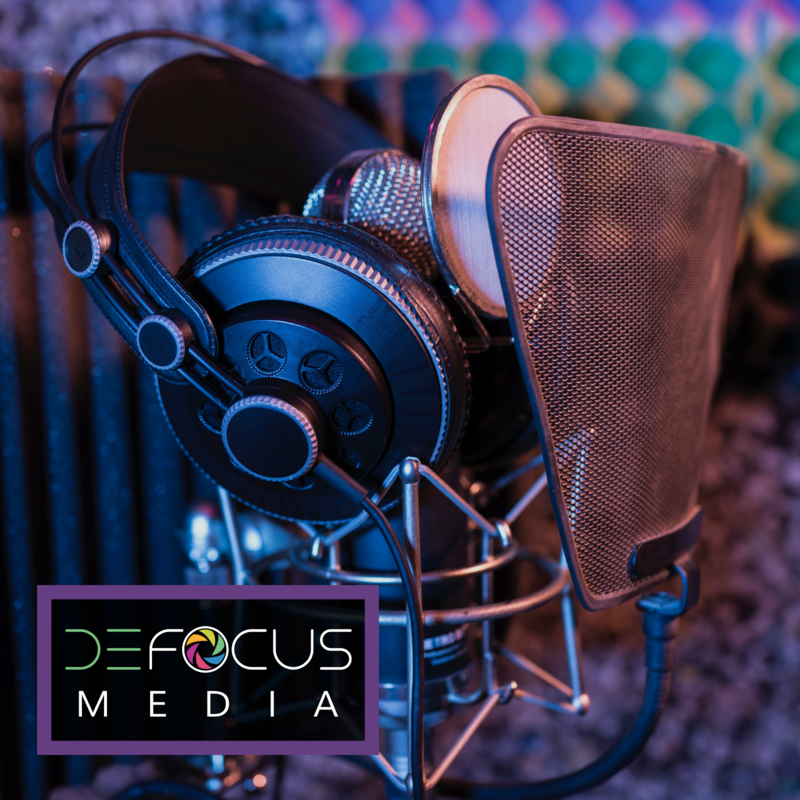 The vision that you see out of the lens can be variable as you change powers due to the rings of prescription that are changing as you increase and decrease the add. This is why these lenses can work well for some and not well at all for others. Keep working with your doctor to try new set ups to find the lens that works for your eyes. I wish optometrists would actually ask their multifocal patients questions. Like: What is most important to you, near or far vision? I have been to 3 optometrists in the past few years and they all are very uncreative. High adds destroy my ability to see far clearly, and night time driving in the rain would be a nightmare. I was given some test lenses, biofinity ( which I love) both -5, +2 add N, and D. Horrible. Worst of both worlds, decent reading, near and intermediate, but anything over 20 yards is blurry. I told him to go down to a -5D, and a minus 4.75 D, both 1.5 add, he reluctantly agreed. Works amazing.Also Alcon dailies. Med add, -4.75, -4.5 work great. I will never go into a high add multifocal. If my reading vision deteriorates, I will spend $20 and buy a pair of reading glasses. the result differs depending on the test. We just worked out that reading add of 1.5 works better than 2.0. Should I ask to try D lenses or N lenses on both eyes? It depends! 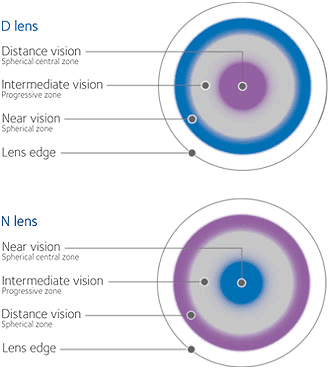 In general D center lenses give better distance vision, and N center lenses give clearer reading vision. But depending on how your brain interprets the power profile of the lens, it may vary greatly. If better distance is your priority, I'd suggest 2 D lenses. If you willing to sacrifice distance for reading you may need 1 or even 2 N lenses (though the latter is extremely rare).